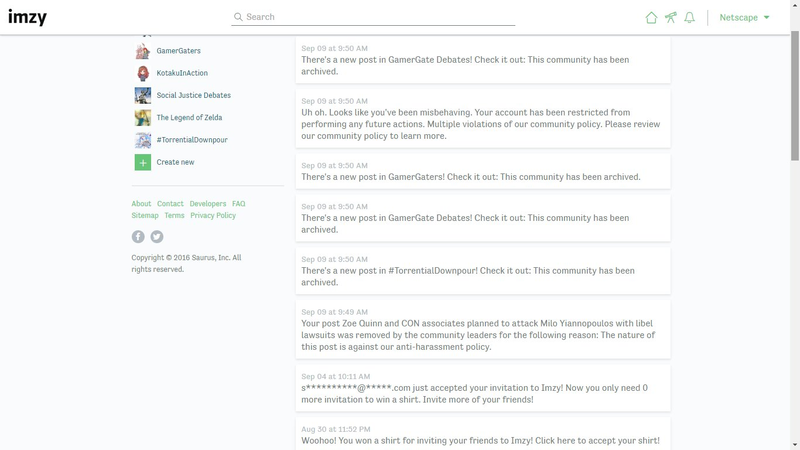 Several #GamerGate communities and the recent Crash Override Network leaks were shut down and barred from being posted on the social media network, Imzy. The reason for the company taking action against the communities and the leaks? Well, because they stated that it violated their terms of service regarding harassment. An online user going by the handle of Netscape shared images where the three communities he ran on Imzy called GamerGaters, GamerGate Debates and #TorrentialDownpour were all archived following a notice from Imzy after posting up the Crash Override Network leaked chat logs. The logs were made available at the end of August, revealing that the anti-abuse organization has partaken in harassment, doxing and sabotage. According to an image shared from his Imzy profile, the communities were shut down on September 9th along with his account. Netscape was curious as to how posting about the Crash Override Network leaks – showing that the supposed anti-harassment organization was engaging in targeted harassment – could be labeled as harassment? I attempted to reach out to Imzy for an explanation of why they removed the post and why the other related #GamerGate communities were shut down, but as of the writing of this article they have not responded. censored other content relating to #GamerGate, with Netscape posting a thread about it on Kotaku In Action. As the image below reveals, a post related to SJWs and censoring video games was removed on the grounds that it was inciting harassment on another platform, namely Twitter. So far there is still no explanation from them how making a post containing factual data of an organization participating in harassment falls within their community policy as being targeted harassment. It seems obvious that certain kinds of information just isn’t tolerated on some platforms, no matter how factual or truthful the information is.